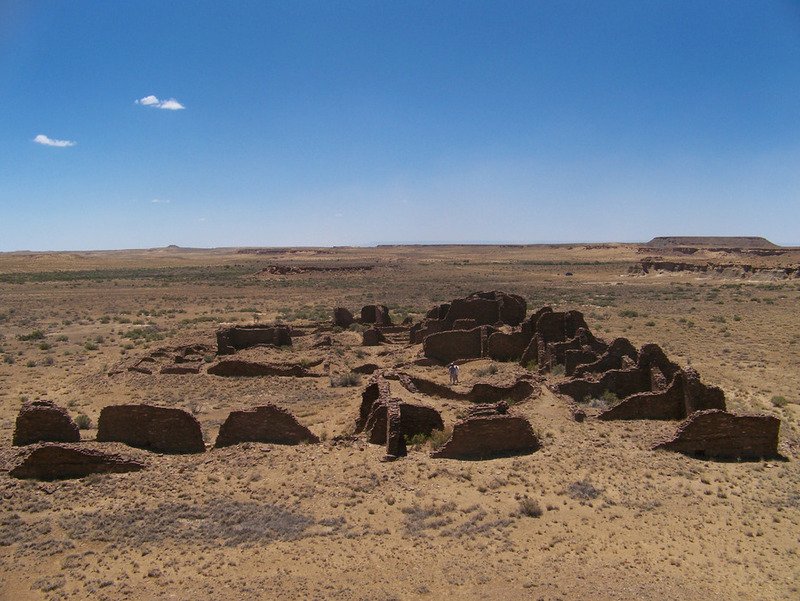 Overview: Kin Bineola is one of several major Chacoan outliers that are protected by the National Park Service at Chaco Culture National Historic Park. It actually lays within a part of CCNHP that is isolated from the main part of the park. 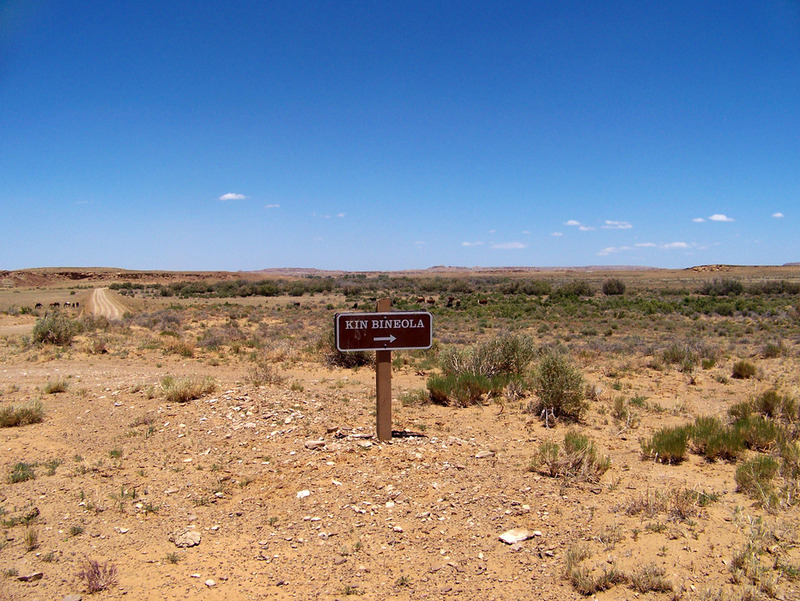 Kin Bineola means "House of the Whirlwind" in the Navajo language. Warning: Kin Bineola is very isolated, hot in the summer, and dry. The nearest services are 24 miles away in Crownpoint. Lake Valley, 8 miles down the dirt road, has very limited services and hours. Kin Bineola is surrounded by tribal and private land - be sure you are not trespassing by staying on the designated route. History: Kin Bineola lays 9 miles southwest from the South Gap, a main entrance to Chaco Canyon. Halfway between Kin Bineola and South Gap lays another Chacoan outlier, Kin Klezhin. All three are connected by a Chacoan roadway. The first Anglo to discover and explore Kin Bineola was Richard Wetherill in the late 1800's. The site itself started life in the early-mid 900's (tree ring dates of 923 to the middle 940's have been found). The initial construction of Kin Bineola was T-shaped, with simple Type I masonry typical of early Chaco sites. That masonry type and the dates from the tree rings indicate that Kin Bineola was going up at the same time as many of the well-known Chaco Canyon sites. Based on the size (or rather, lack) of the midden and its contents, archaeologists have determined that Kin Bineola not occupied very often, if at all, during its period of utility. The only debris and refuse found from the 900's are from the construction period. After a almost 150 years, Kin Bineola was expanded into its current E shape. Again, the refuse mounds remained small. While there is some evidence that at least a caretaker population lived nearby, based on the fact that agricultural ditches exist in the area, there is no hard evidence for farming in a manner that would have supported a large population. The area that Kin Bineola is located does not have a shallow water table, nor does water consistently flow through the Kim-me-ni-oli Wash nearby. Almost certainly, anyone living at Kin Bineola would have required imported food, likely the nearby Lake Valley site, some 4 miles down the Kim-mi-ni-oli Wash, near the confluence with the Rio Chaco. In prehistoric times, two roads existed from Kin Bineola - one leaving from the southeast side of the building that can still be faintly seen, and another heading northeast towards South Gap and Kin Klezhin. Hike: The hike is a one-mile, round trip hike. Passing through a hiker's make at the parking area, you will be walking along a Park Service access road to the site. Near the southwest corner of the ruin there is a sign explaining a little bit about the site. The sign also has a reconstruction of what the final three-story Kin Bineola Great House would have looked like. Explore the ruin, climb the nearby hill to take in Richard Wetherill's view, and then return to your vehicle the same way that you came in. Water Sources: None. Bring all you need, and then some extra. Camping: Camping is not allowed in Chaco Culture National Historic Park except in designated campsites. There is only one location that has designated campsites, and that is Gallo Campground. From Crownpoint, it is exactly 24 miles to Kin Bineola. 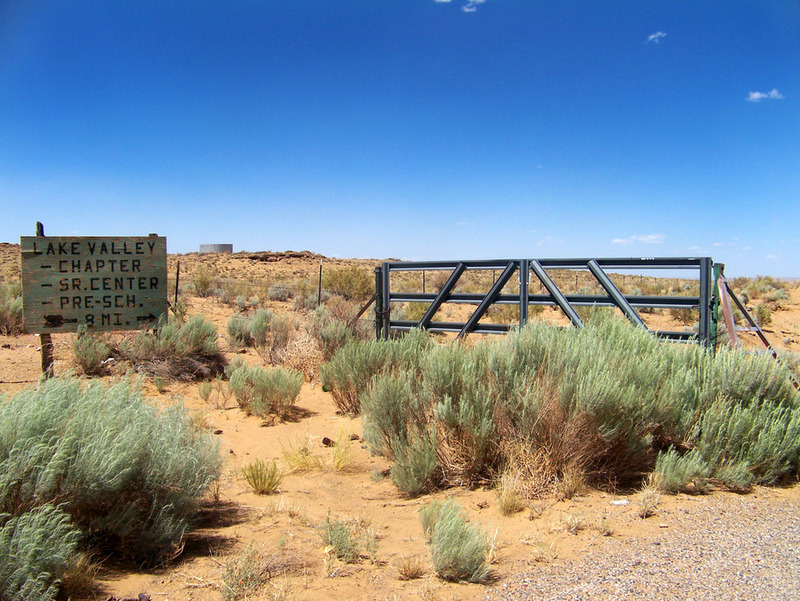 Most people visiting Kin Bineola start from the Visitor's Center in Chaco Canyon. These directions will take you from there to Kin Bineola. Starting at the Visitor's Center, head south on Route 57 for about 20 miles until reaching Route 9. Turn right on Route 9, towards Crownpoint. 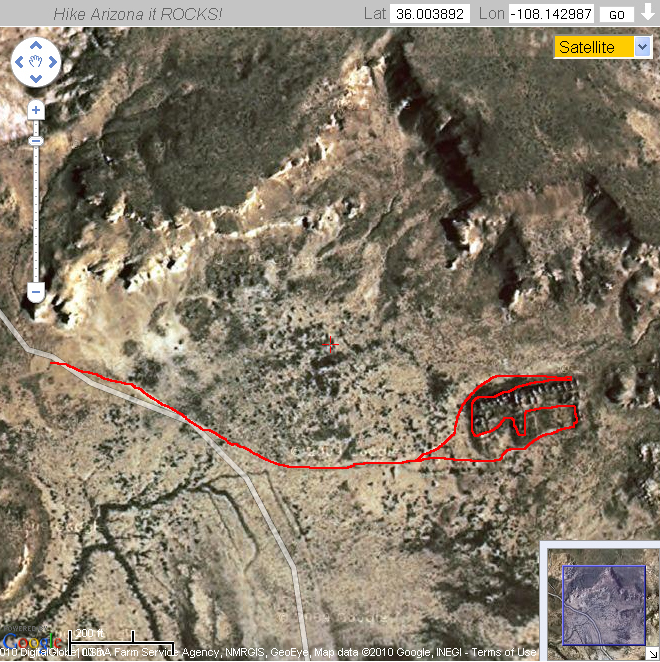 Drive 13.4 miles on Route 9 until you come to NM371. This is where the route would converge with the route from Crownpoint, in which you would already have been driving north on NM371. Turn right and drive approximately 10 miles north to the junction with Navajo Route 7059. This is not signed for Kin Bineola or NR7059, but there is a gray water tank and a sign for the Lake Valley Chapter House. Follow this dirt road, passable to cars and minivans in good weather, for about 4.5 miles. You will see the green growth of Kim-me-ni-oli Wash ahead as the road drops towards it. Just before the road crosses Kim-me-ni-oli Wash, you will see a sign that says "Kin Bineola" on it. Turn right, and the road crosses an earthen dam. Once on the other side, you are within the NPS section of land. Follow the road to the parking area by the gate.